The Deep Sea News crew knows how to party. Photo by hanjeanwat. 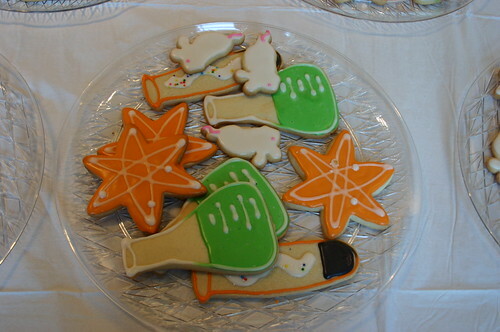 The science blogosphere was abuzz with ScienceOnline 2011 recaps, post mortems, and soul-seeking. The Columbia Journalism Review gave the conference a nice write-up. Dave Munger meditated on the line between jazzing up science and dumbing it down. Chris Rowan pointed out that no matter how well science blogging shapes its outreach, the broader media often fixes the game. Ed Yong worried that science blogging was “stuck in an echo chamber,” and Ryan Somma mapped it. Christie Wilcox tried out what she’d learned about online writing by murdering a darling. And Minority Postdoc started an inventory of diversity in the science blogosphere. Watch out for the photo of a “cutaneous abscess.” All the antibiotics we’re feeding to livestock are leading to higher rates of antibiotic-resistant infection in farm workers. We like taxonomists, really! We just don’t want to pay them. Biology needs taxonomy, but these days no one wants to be a taxonomist. Flock immunity. Genetically modified chickens can catch avian flu without spreading it to others. And finally, here’s long-awaited video of Robert Krulwich’s inspiring ScienceOnline keynote address. 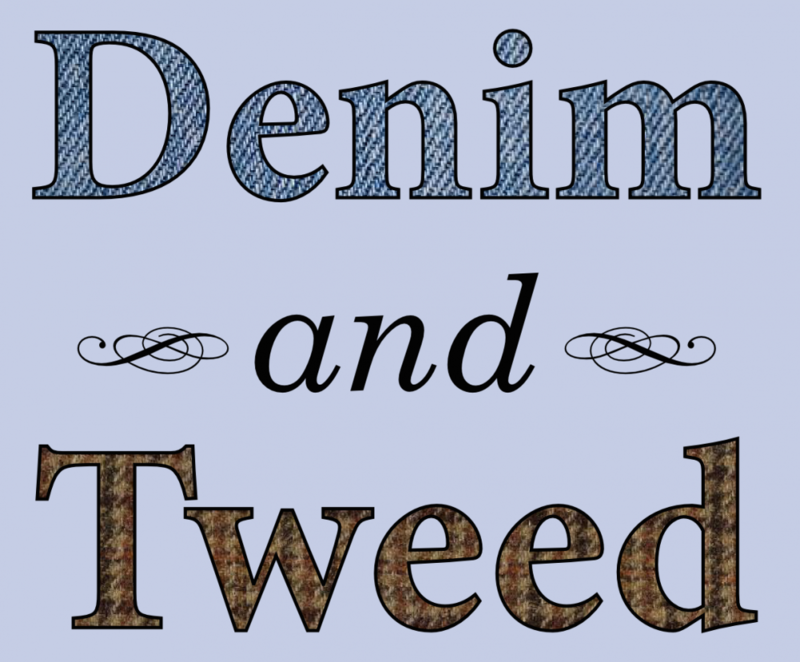 Part two, and more, is at A Blog Around the Clock. 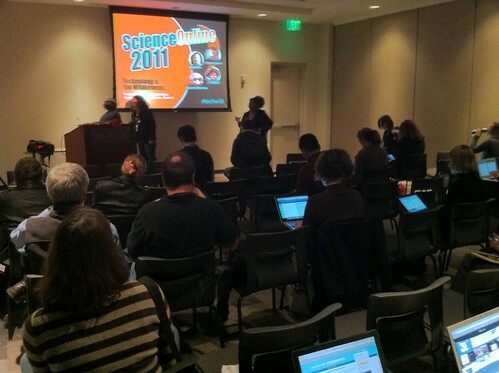 In session at ScienceOnline 2011. More photos are in the ScienceOnline 2011 Flickr group. Photo by cephalopodcast. In data discoverability, Kiyomi Deards, Molly Keener, and Steve Koch covered the logistics of open notebook science from making published papers freely available online to opening up datasets as they’re collected. There wasn’t discussion about the point at which scientific results ought to be freely available outside the lab—I’m all for making my papers and the final data underlying them open access, but I don’t necessarily want to post my working notebooks. In the first line of response, the crew of Deep Sea News and John Amos of the organization SkyTruth discussed how online coverage of the Gulf of Mexico oil spill this spring helped to counter frequently inaccurate official stories, and how they could maintain public awareness in the aftermath. It was the only session I attended that performed a formal post mortem on one of the biggest events for online science writing in the last year, and it had some useful insight for covering and responding to future disasters. How to explain science in blog posts was the closest I’ve come to a writing workshop since undergrad. A long list of top-notch bloggers and writers (Scicurious, Joanne Manaster, Maryn McKenna, Vivienne Raper, Eric Michael Johnson, Brian Mossop, Carin Bondar, Melody Dye, Christie Wilcox, and Ed Yong) split the attendees into groups to discuss content choices, the writing process, blog design, and how best to promote work online. After the sessions, Saturday’s activities concluded with a banquet that shaded smoothly into drinks at the hotel bar, and then more drinks in the suite rented by a couple members of The Gam. I called it a night at about 2 a.m. Now I’m leaning heavily on the free coffee in this morning’s final sessions about blogging in academia and the purpose of public science outreach. It’s been a great weekend. Unlike most academic conferences, ScienceOnline is an opportunity to talk with scientists outside my immediate field and, maybe more importantly, a lot of non-scientists. It’s been good to see a bunch of folks I met last yearagain, and to meet more folks I’ve previously known only as Twitter avatars and/or fantastic online writers, especially Dr. Skyskull/Greg Gbur, Dr. Freeride/Janet Stemwedel, Eric Michael Johnson, Holly Bik, and Steve Silberman. Apologies if I’ve missed anyone, but there was quite a bit of booze involved. 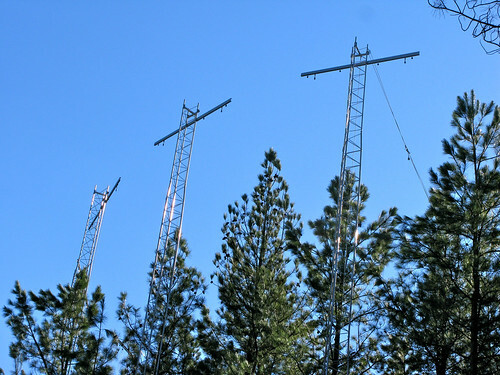 In the Duke University research forest, towers like these dosed experimental plots with carbon dioxide to simulate the effects of climate change. Photo by jby. I arrived last evening at ScienceOnline 2011 barely coherent after thirteen hours of travel from Moscow, Idaho (2 a.m. Pacific time) to Durham, North Carolina (about 6 p.m. Eastern time). Robert Krulwich’s keynote address woke me back up. Krulwich explained his approach to science journalism and illustrated it with clips from his work, including the transcendently good Radiolab. How do you get your audience excited about science, according to Krulwich? Talk about what excites you, and lead them to discover it with you. I spent this morning touring the Duke University research forest outside Durham, where scientists from Duke and many other institutions are conduction some amazingly ambitious ecological experiments. Biogeochemist Ben Coleman presented studies of nanoparticle movement through terrestrial and aquatic ecosystems using mesocosms—semi-contained natural communities. 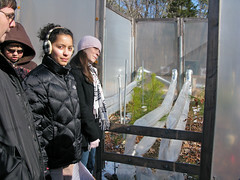 View inside an experimental warming plot. Photo by jby. Carl Salk, a Ph.D. candidate in biology, walked us through plots that are being heated to simulate a changed climate. The plots are enclosed on four sides by plastic, with warm air pumped in via ductwork and electric lines warming the soil to bring them up to 3 or 5 degrees Celsius warmer than the outside. It doesn’t sound like much, but it makes a difference. Salk says plants in the warmed plots are developing leaves days and, in some cases, weeks earlier in the spring than plants in control plots. The final stop was the biggest experimental setup, Duke’s Free Atmospheric Carbon Enrichment site, which has been testing how forests will grow in an atmosphere containing more carbon dioxide by pumping more carbon dioxide into forest plots. This is achieved with rings of towers like the ones pictured at the top of this post spraying carbon dioxide into experimental plots. The gas is reclaimed from fertilizer production, and into the air anyway; the experiment simply boosts it locally. The sheer volume of research done within these plots is amazing, but the site is now shutting down after 15 years. 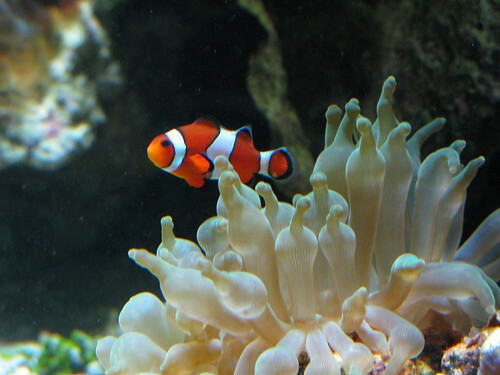 Clownfish, anemone—and zooxanthellae makes three. Photo by jby. First, the latest on ScienceOnline2011: The keynote speaker for the annual online science conference will be Robert Krulwich, the inimitable NPR science correspondent and co-host of Radiolab. And NESCent has announced the winners of its (now annual?) Science Online travel award for science blog posts: How Some Females Respond to Nuptial Gifts by Danielle Lee and Do mother birds play God? by Neil Losin. Go give them, and all this year’s entries, a read.